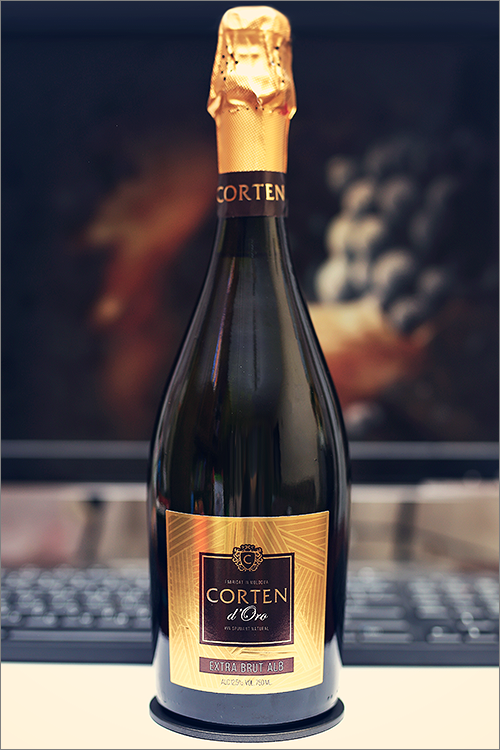 Tonight we present you one of the stars of crémant wines made in Moldova – Corten d’Oro Extra Brut Alb from Corten. This wine is reproducing the famous italian Prosecco, which is made with glera grapes, produced using a non-traditional, tank method, also called méthode charmat – a wine style that is growing in popularity with each passing season. Prosecco is the most famous italian crémant wine that is meant to be enjoyed young and fresh, in order to experience its full aromatic profile, but enough theory, without further ado, let’s get straight to the tasting and find out how good this wine is. Pale yellow color with clear white hues towards the rim of the glass. The nose is rich, filled mostly with sweet fruits flavours: yellow apple, yellow mirabelle, white nectarine, white apricot, lemon, white cherry, pomelo, white grapefruit, lees, oakwood, homemade butter and some nunces lactic hints of yoghurt. The wine is dry, with moderate alcohol level, high acidity and smooth tannin. It tastes crisp, lactic and quite refreshing, with a nuanced buttery-yeasty accent. This is a creamy, zesty and slightly bitter wine, with a fair overall balance and an appealing, fruity-citrusy ending. It has a medium finish and a balanced, bitter-crisp aftertaste. Conclusion: this is a well made sparkling wine in its peak form – crisp, refreshing and extremely appealing, with a quite smooth and creamy accent. Drink it now, as this is the optimal time, or in the next 12 months, as there’s no real reason for any more bottle ageing. This is one of the few Prosecco wines in Moldova, therefore don’t miss it, as it is history in the making. We highly recommend to pair this wine with a maple roasted quince and brussels sprout salad or some creamy scalloped oysters. Cheers!